Osmosis: Non-steroidal anti-inflammatory drugs. (2019, April 24). Retrieved from (https://www.osmosis.org/learn/Non-steroidal_anti-inflammatory_drugs). 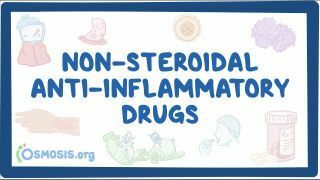 Nonsteroidal anti-inflammatory drugs (usually abbreviated to NSAIDs /ˈɛnsɛd/ EN-sed), also called nonsteroidal anti-inflammatory agents/analgesics (NSAIAs) or nonsteroidal anti-inflammatory medicines (NSAIMs), are a drug class that groups together drugs that provide analgesic (pain-killing) and antipyretic (fever-reducing) effects, and, in higher doses, anti-inflammatory effects. Ibuprofen, from isobutylphenylpropanoic acid, is a nonsteroidal anti-inflammatory drug (NSAID) used for treating pain, fever, and inflammation. This includes painful menstrual periods, migraines, and rheumatoid arthritis. About 60% of people improve with any given NSAID, and it is recommended that if one does not work then another should be tried. It may also be used to close a patent ductus arteriosus in a premature baby. It can be used by mouth or intravenously. It typically begins working within an hour. Indometacin (or indomethacin) is a non-steroidal anti-inflammatory drug (NSAID) commonly used as a prescription medication to reduce fever, pain, stiffness, and swelling. It works by inhibiting the production of prostaglandins, molecules known to cause these symptoms. It may also be used to close a patent ductus arteriosus. Naproxen (trade name Aleve) is a nonselective COX inhibitor. Naproxen is a nonsteroidal anti-inflammatory drug (NSAID) of the propionic acid class (which puts it in the same class as ibuprofen) commonly used for relief of a wide variety of pain, fever, swelling and stiffness. Diclofenac is a nonsteroidal anti-inflammatory drug (NSAID) taken or applied to reduce inflammation and as an analgesic reducing pain in certain conditions. Ketorolac is a non-steroidal anti-inflammatory drug (NSAID) in the family of heterocyclic acetic acid derivatives, used as an analgesic for short-term management of moderate to moderately severe pain. How do NSAIDs influence Furosemide action? A 56-year-old man comes to the clinic because of shortness of breath that began this morning. He reports a one-week history of progressively increasing pain in his left leg. His left leg is edematous and the calf muscles are tender to palpation. For years, he has been using celecoxib for his rheumatic disease. The use of celecoxib may contribute to the patient’s leg pain and dyspnoea in which of the following ways?